Some days writing blog posts seems like a chore, especially when I have a long list of things to get done that day. Even though I’m doing something I love, let’s face it - work is work! This morning in particular I have been staring away at my screen. The recipe is all ready to go - in fact I wrote it down a couple of days ago in the process of cooking the soup so that I wouldn’t forget the spices I used. But I find myself looking for other things to do - set up my new Instagram account (@my.ayurvedic.kitchen), schedule an appointment to get my car serviced, warm up some soup to fuel my brain as I work… check, check, check! And I’m back here again, wondering why I can’t get my fingers to move across the keyboard. I think about what I did this past weekend. 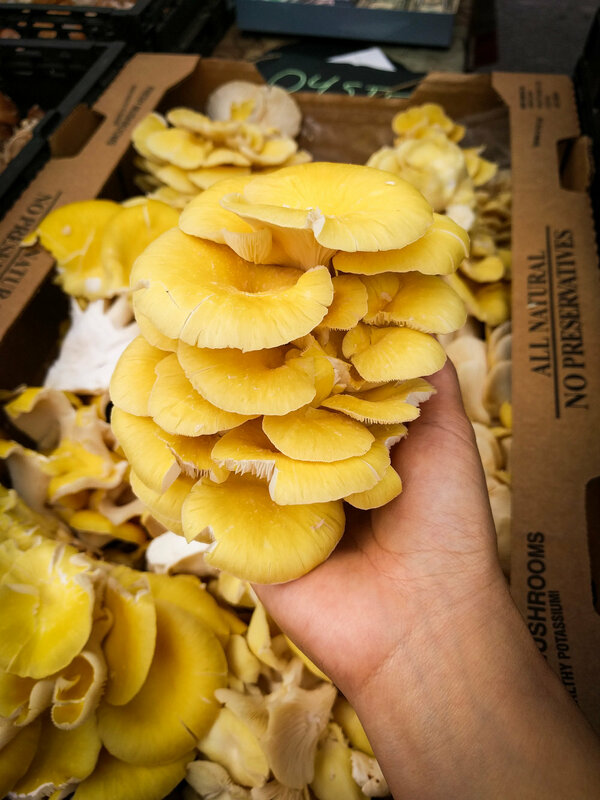 I visited the SFC Farmers’ Market (@sfclocal) in downtown Austin and as always, being around farm fresh produce and talking to the vendors gave me lots to think about and in turn inspired this post. I picked up some korean melons, butternut squash, sweet potatoes, and radishes from my favorite vendor Johnson’s Backyard Garden (@jbgorganic). I also saw my first uncooked oyster mushroom and boy was it a beauty! 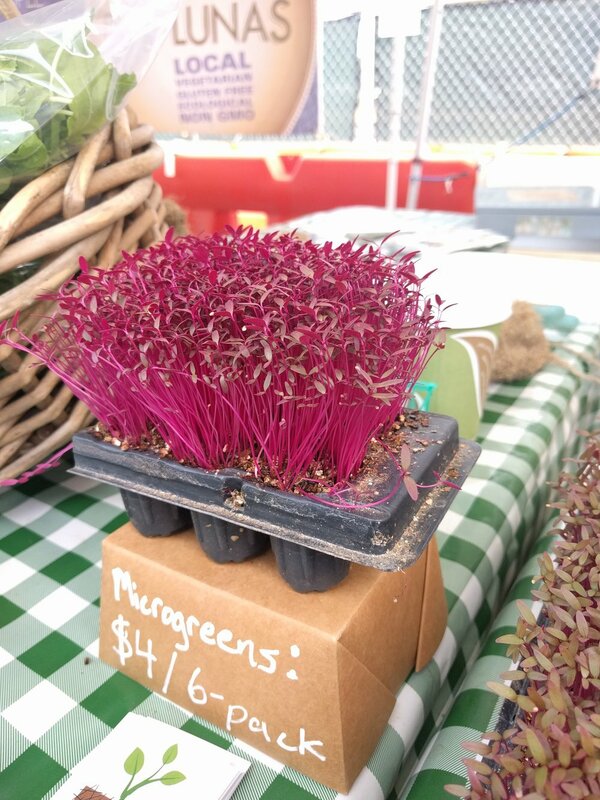 I learned a little about microgreens from Joe’s Microgreens (@joesorganics) and I picked up some amaranth microgreens (or “microreds” in this case). Though I don’t eat a lot of raw foods in my diet, I used the amaranth microgreens as a garnish for my butternut squash coconut soup and I found that it added a hint of bitterness - balancing out a rather sweetish soup which was an unexpected, yet pleasant, outcome. Butternut squash like a lot of other squashes in the pumpkin family are a great vata pacifying food. It is sweet, earthy, grounding, and warms my insides up nicely once all the spices have been added. I also wanted the element of pitta pacification in this recipe so I added the coconut milk, which gave the soup some extra creaminess. Yum! Heat the oil in a wide bottomed pot. Sauté the onions until they are transparent. Add the grated ginger and sauté for another minute. Add the turmeric, cinnamon, clove, and black pepper and let them roast for a couple of minutes until they release their flavors. Mix in the butternut squash, coating well with the spices. Cook the butternut squash until it is mushy - adding water as needed to keep the squash from sticking to the pot. Once the squash is fully cooked the skin will soften quite a bit making it easy to blend. Add the coconut milk and cook until hot. You don’t want to boil the coconut milk as it will separate. If you’re using an immersion blender, blend the squash well until you achieve a smooth consistency. If you’re using a regular blender, wait until the soup cools down and then blend. You don’t want to blend hot soup in a blender as the pressure of the steam can cause the lid to pop and you will end up with soup everywhere… yes, everywhere! I’m speaking from experience. Return the soup to the pot and place over medium heat. Add salt to taste. At this point if the soup is very thick, add vegetable stock until the desired consistency if achieved. Turn off the heat just as the soup starts to boil. Serve warm. Enjoy with a side of dinner rolls or toast! Butternut squash is grounding and balancing for vata and sweet enough for pitta. The blend of spices creates a warming effect which is ideal in the Fall and Winter months. The sweet and cooling effect of the coconut milk helps to keep pitta in balance, while still working on vata. Add a little more black pepper or some red chilli powder. Skip the coconut milk, using vegetable stock in its place. Butternut squash has a rather tough skin, which softens significantly upon cooking. If you’re using an organic butternut squash, leave the skin on in order to benefit from all the nutrients present. If it isn’t an organic squash, you’ll definitely want to peel the squash to avoid all those nasty pesticides! Canned organic coconut milk is super rich and creamy and usually consists of just two ingredients - coconut milk and water. You don’t want to use boxed coconut milk because of all the added preservatives. The boxed kind also has very little actual coconut milk, which is the same for light coconut milk. You’re paying mostly for the water and losing out on the delicious coconut flavor.